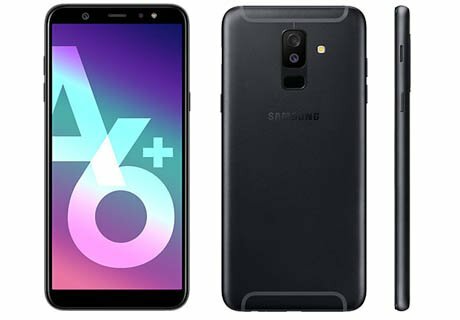 As infinity display going to be trending, Samsung launched a mid-range Smartphone Galaxy A6+ designed with an expansive, near bezel-less Super AMOLED display that features vivid resolution and stunning contrast where you can enjoy an immersive and uninterrupted gaming and video watching experience. It has 6.0 inches FHD+ display, Android 8.0 (Oreo) OS, Snapdragon 450 CPU, Dual 16+5MP Primary | 24MP Secondary Camera, 32/64 GB Internal | 256 GB SD Card support | 3/4 GB RAM and 3500 mAh battery. With the compactly built quality and 6.0 inches Super AMOLED Infinity Display having vivid resolution and stunning contrast phone looks astonishing from every angle. 1080 x 2220 pixels display with 18.5:9 aspect ratio shows all the visuals clearly with vivid colours. The Always on Display lets you view key information such as date, weather alerts, time and incoming notification in a flash. In this handset, the volume keys are located on the left edge and power button along with a speaker on the right. The bottom is housing 3.5mm audio jack and MicroUSB slot. Galaxy A6+ features a 16+5MP Dual setup primary camera with a wide aperture of f/1.7 which helps in taking bright photos even at the place of insufficient light. It has 5MP companion camera for accurately sensing the depth (Live focus allows you to a user can manually adjust the depth of field before and after the photoshoot). there is a 24MP secondary camera with a faster, wide aperture F1.9 lens to let in more light when taking selfies in darker environments. It also features three-level front flash adjustment to avoid image degradation and glare when shooting selfies day and night. This handset has various camera modes, stickers and creative filters to liven up what you capture and organize your images and videos by theme. The performance is controlled and managed by the Qualcomm SDM450 Snapdragon 450 processor coupled with 4 GB RAM that offers smooth operations for most of the day to day tasks, although the heavy gameplay shows some frame drop. App Pair feature which lets user monitor and manages two apps simultaneously for easily and efficiently. For the security along with fingerprint sensor, it has Face Recognition technology granting mobile access for you alone. The Non-removable Li-Ion 3500 mAh battery offers a decent backup where you can call for 21 hours over 3G network. It also supports the Always-on display. The camera works expectedly well in the low light area. The phone also supports NFC and FM radio. There is no Type C slot and Quick Charge support. Not supporting slow-mo and 4K video recording. This handset is not waterproof.